This wreath with its red, white and blue flowers displays its patriotic spirit to all. 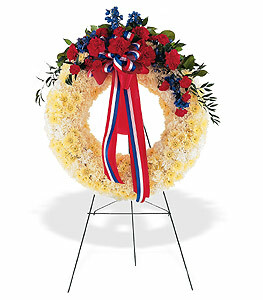 One solid white wreath arrives on an easel decorated with red carnations and blue delphinium, along with a patriotic red, white and blue ribbon. Page loaded in 0.5538 seconds.